The Bestek MRJ1011 Wi-Fi smart plug is a device that can turn on or off the AC outlet on it’s front. The device can be controlled manually, self-controlled by timers set by an app, or controlled by the IoT through the Smart Life app, Amazon Alexa, Google Home, or IFTTT. It also has two 2.4 amp USB ports. Read on to see what I think! 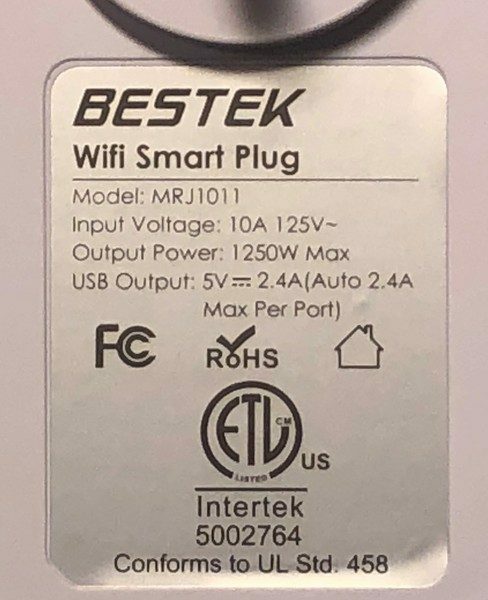 The Bestek MRJ1011 Wi-Fi smart plug is part of a new wave of inexpensive AC Adapters that allow users to remotely turn on and off items through a Wi-Fi connection. Smart plugs came into existence about eight years old; even though they costs less these days, they still offer about the same features as they did at their introduction. 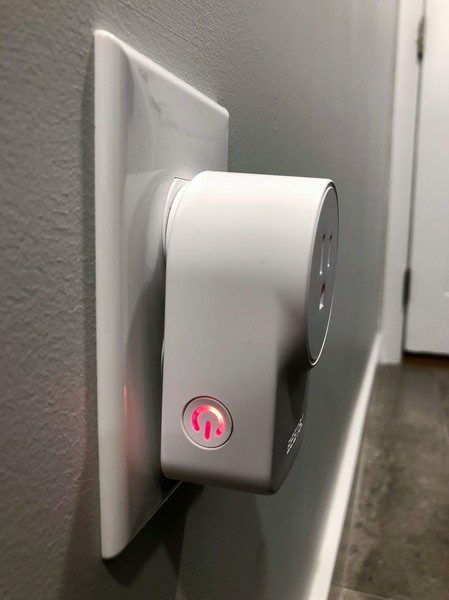 Not every manufacturer offers every feature but the smart plug generally offers local control, remote control by one or more communication protocols, energy monitoring, and USB power. The design of smart plugs includes various layouts and power capacities. What has immensely improved in the past eight years is the maturity of home automation and IoT. These days, the capacity of the smart plug to integrate with home automation and IoT is a key component of it’s usability. 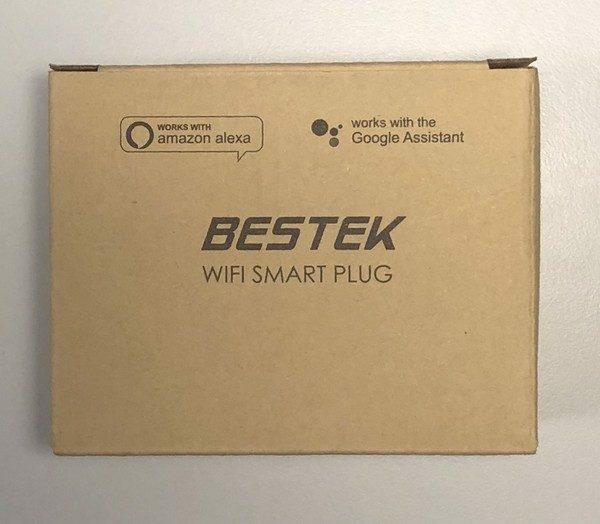 The Bestek Wi-Fi Smart Plug comes in a no-frills cardboard box. The two pack comes in a cardboard sleeve. 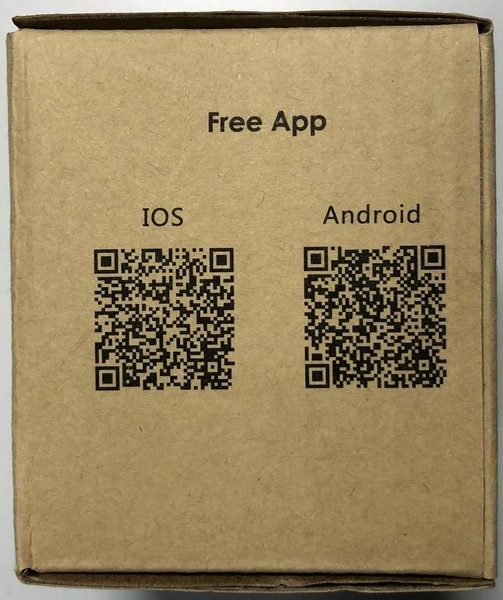 The front, back and sides are printed with the product, specifications, and QR codes for the control app. The QR codes below will redirect you to a page to download the control app. 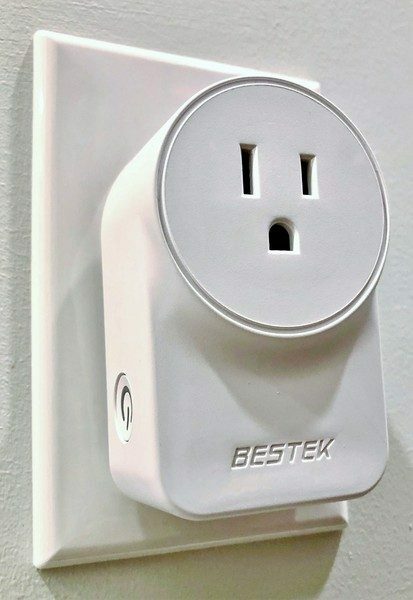 The Bestek MRJ1011 Wi-Fi smart plug is a white plastic plug adapter that looks similar to the “wall wart” transformers that are part of many electronics. However, like many Apple voltage adapters, its smooth lines and unobtrusive design enables it to blend in to light colored wall plates better than the typical black plastic designs. The front of the unit contains a 15 amp grounded receptacle. Since it isn’t tamper resistant, to comply with the intent of the NEC and for general safety, only install the smart plug if an item is plugged in it. Also, even though the receptacle on the front is a 15 amp design, the unit itself is only rated to 10 amp. 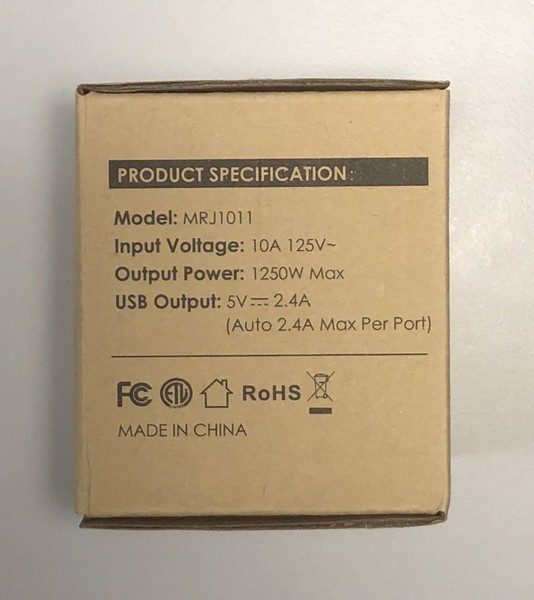 Consequently, to ensure that this item is not overloaded the user must be cautious and ensure the wattage of items plugged in to the front does not exceed 1250 watts. This precludes using this item with many space heaters, most ovens/toasters and perhaps coffee brewers. I do not see any internal circuit breaker or fuse, so I’m not sure what will happen if this powers something over 1250 watts. The rear of the unit includes a specification decal and the unit’s plug that slightly protrudes from the rest of the unit’s rear. 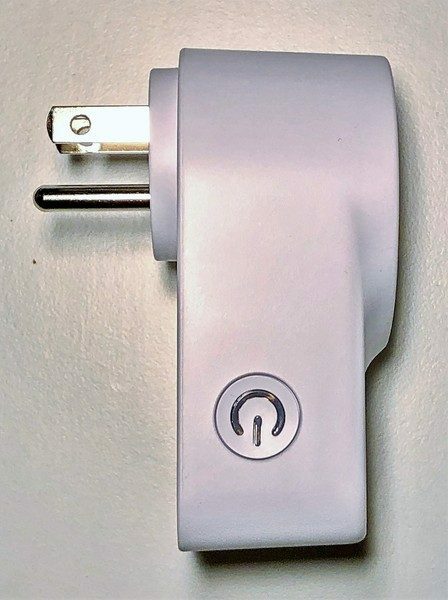 The stepped design of the real may allow installation of the smart plug on decorative wall plates where the outlets are slightly below the highest point. 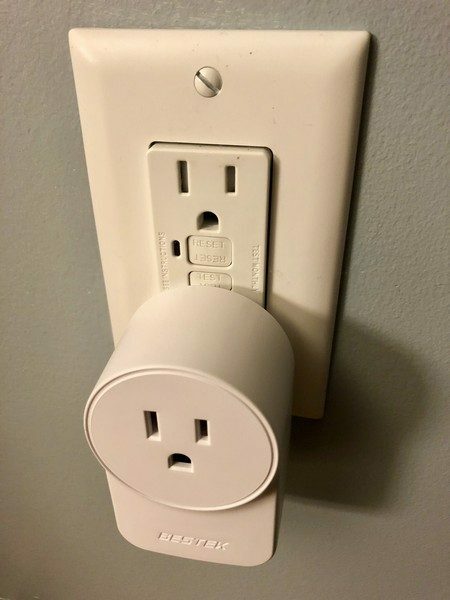 The unit’s plug does not block the top outlet of a duplex receptacle. 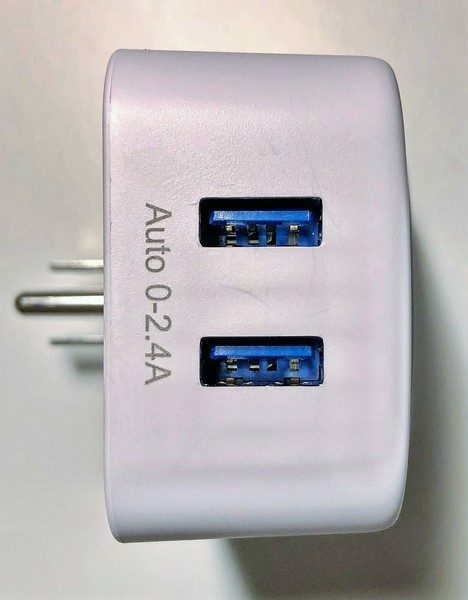 However, the portion of the smart plug that contains the electronics and the USB connections will block the bottom outlet of a duplex receptacle. The bottom of the unit contains two USB plugs that are not switchable but can power and recharge USB devices. 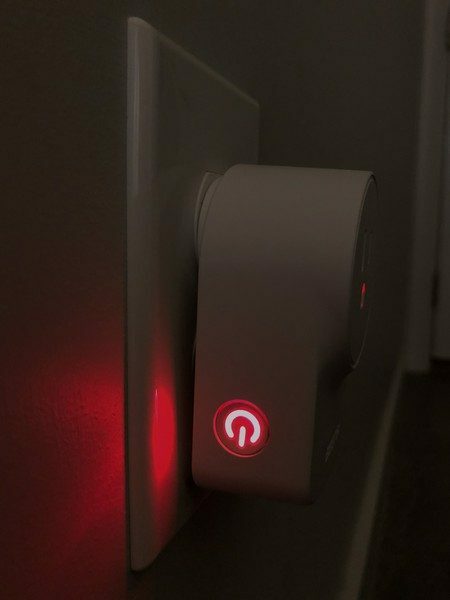 The smart plug operates in three ways: by the manual pushbutton, by an internal timer, and by an IoT signal. Manual operation is by a pushbutton on the unit’s side. When the receptacle on the front is on the button glows red. The red glow may seem overbearing at night. Some electrical tape will block out the red glow if its presence is a nuisance. Timer mode requires the Smart Life or BESTEKHOME app. You can use either one – the BESTEKHOME app is the same as the Smart Life app with a new title and app icon. To connect the smart plug to the app power it on, wait ten seconds and then power it off, then hold the power button for ten seconds. The power button will blink after performing these steps. The app will ask for Wi-Fi credentials so that the device can join a network on its own. Note that this device only supports 2.4Ghz Wi-Fi channels. The device has its own access point that can pair to a phone if no other Wi-Fi is available. in this scenario, the phone needs to join the devices AP. After installation, the app can turn on the device remotely, turn on or off the device after a set time (like a countdown timer) or schedule the device to turn on or off at some future time. The schedule may apply to each day or certain days during a typical week. 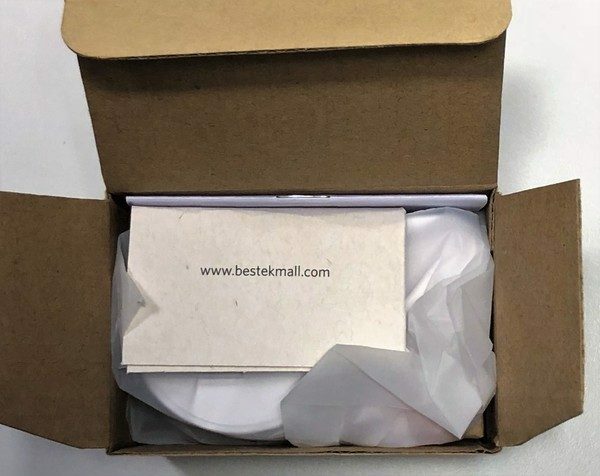 There is an entire 26-page booklet of instruction for how to connect the device to Amazon, Google, or IFTTT. The manual can be viewed here (https://fccid.io/2AKS6-MRJ1011/User-Manual/User-Manual-3801625) on the FCC site. In each case, the first step is to pair the unit with the Smart Life or BESTEKHOME app. The activation by Amazon Alexa is straightforward and the IFTTT includes both trigger and action. Note that IFTTT integration permits SmartThings to interact with the device; IFTTT can turn on the physical smart plug when SmartThings switches on a virtual switch, and vice versa. The operation through the Smart life or BESTEKHOME app is very quick and operation through Amazon Alexa is only a little slower. The relay inside does make an audible pop, so using this to blink decorative lights is going to create a lot of unwanted noise. 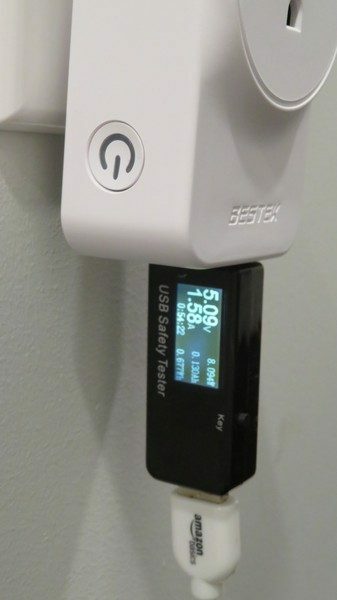 The smart plug contains circuitry that optimizes USB port current to intelligently charge or power the connected device. However, I was not able to get a full 2.4 amps out of the port even with a mostly dead phone battery. 1.58 amps is the highest draw I saw. 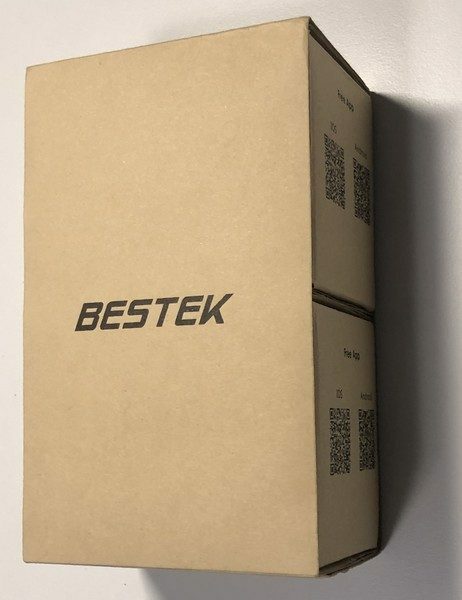 The Bestek MRJ1011 Wi-Fi smart plug has a host of connectivity options that enable control with a variety of services. If the allowable current were only more than 10 amps this would be a really great design. 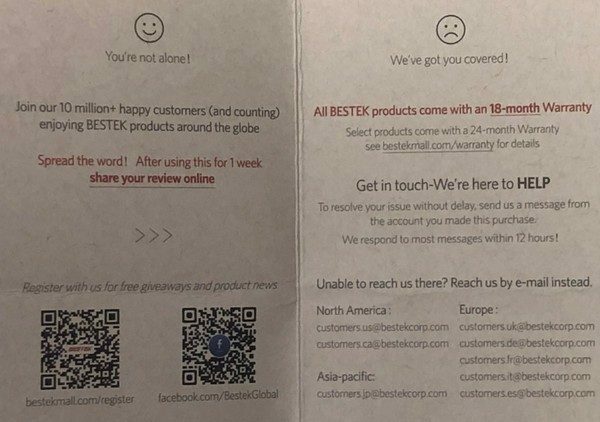 Source: The sample for this review was provided by BESTEK.